The Cabin features pine paneling throughout, a high open ceiling in the living room and furnishings and a woodsy wildlife décor from the Myrtlewood Gallery to give it a true Northwest feel. 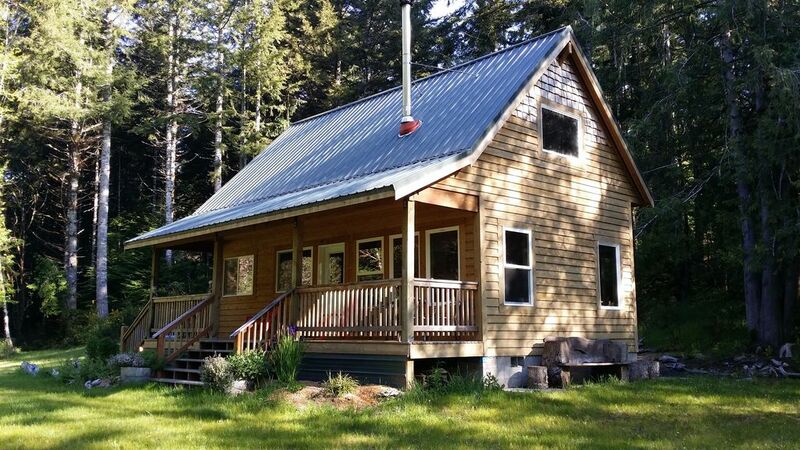 The Cozy Cattail Cabin is most comfortable for 2-3 persons (but does sleep 4) and is the most secluded as it is nestled behind the trees. There are 2 bedrooms: A Beautiful Myrtlewood queen bed with a memory foam mattress in the upstairs spacious loft bedroom and a comfortable double size bed in the tiny bdrm downstairs right next to the bathroom. A space heater is available but is tucked away for those rare freezing days. The cabin has washer & dryer and a charcoal grill out the back porch and a picnic table in the woods. We are tucked into a little valley where Intermittent cell phone reception is only sometimes available at the chairs by the dock. 5 miles out of town on property which had been an old dairy farmstead. Relax down by the dock in the chairs overlooking the water. The wood stove is our main source of heat. Firewood provided. Very efficiently heats the whole cabin fairly quickly. Damage Deposit is refunded to you after your stay. No pets allowed at the Cabin. See our pet friendly Cottage if you are traveling with a pet. No large parties. No smoking inside or on the cedar porch. If you are pulling a trailer Please use extra caution crossing the bridge. The bridge is 10ft wide but some people have difficulty with the approach. Alternatively you might want to store your trailer in town during your stay.